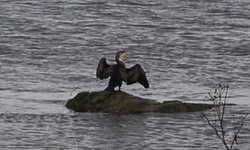 Tranquillity by the Castle on the river Slaney highlights the bird life. A glimpse of a kingfisher flashing by is always a treat. Sand martins feed over the water and Cormorants are waiting ready to dive. Bare mudflats at low water are favorite feeding places for redshank and blackheaded gulls and while these are the most common species it is not unusual to see Gray Herons, Kingfishers, Curlews, Oyster catchers, Shelducks, Redshanks, Hooded Crows and Herring Gulls as well as Mallard and Tufted Duck which are regularly seen together with Mute Swans in the quiet stretches of water.